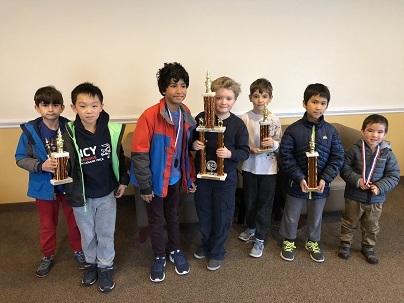 It was an exciting day of scholastic chess at CCFC as we hosted our monthly championships. In the K-2 section it was regular competitor Jasmine Thiessen who won all of her games to take first place. Also putting in solid performances were Sarvesh Neelavalli and Iri Pullepu with 3 points each to tie for second. Kiran Behringer, Anthony Low, Conor Filip and Levi Feldman finished in a tie for 4th place with 2/4 each. Meanwhile, Angus Pittenger entered the K-5 section as the favorite. 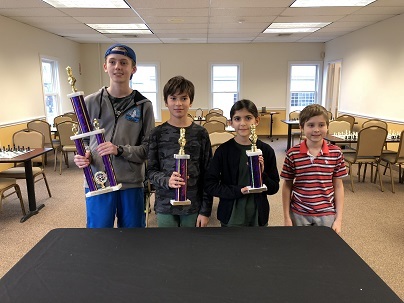 Despite some close encounters he was able to win all four of his games to win first place. Tied behind with 2.5/4 each were Ian Moffitt and Brian Yee. Both put in impressive performances. Cary Wang, Arjun Leih and James Stewart shared 4th place with 2/4 each. Our K-12 sections have been increasingly competitive and this month was no exception. With three rounds every half point matters. Jack Klein avoided any mistakes and cruised to victory with a perfect 3/3 score! Just behind were Varsity Dream Teamers Nicholas Kurbanov and Serena Evans who tied for second with 2.5/3 each. William Siege, Mikhail Bilokin and Sahil Vora also had solid performances and tied for 4th place with 2/3 each. 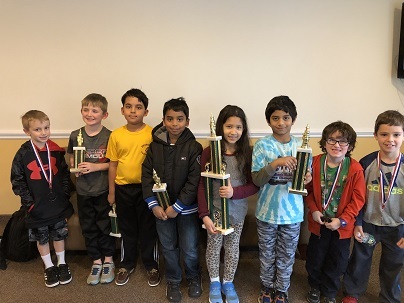 As always we can count on all of our participants to put their best foot forward both in their play and their sportsmanship, and they did not disappoint during this event. Thank you to all of our participants and congratulations to the winners!